David Haase, owner of Attitude Sports knows what it takes to be successful in the demanding bike and ski retail industry. His current store has been in operation for over ten years. Wind Mill slatwall and display fixtures play an important role in the merchandizing of product. At Attitude Sports, the inventory is kept up front and rotates quickly. “Slatwall has definitely made us more profitable!”, David Haase - Attitude sports, Inc. This short video takes you behind the scenes of Wind Mill Slatwall Products and into the essence of what we do. More than custom slatwall, display panels, and component parts manufacturing, the employees of Wind Mill strive to provide solutions to maximize retail space for our customers, finding the right solutions. Since 1980 we have been innovating the highest quality, most versatile slatwall in the industry. We thrive on custom projects. It all begins with our customers’ needs, driving us to ask the question “What can we build for you”? Mark Radtke, General Manager and V.P. of Manufacturing was recently interviewed by Deidre Martinez, Executive Director of the Sheboygan County Chamber and Host of “Love Where You Live”. This half hour TV show featured manufactures to celebrate national manufacturing month. Filmed live at WSCS studios, Mark and Deidre discussed Wind Mill Slatwall Products, its people, culture and products. The following video is complements of WSCS Sheboygan. “Ask the Experts” catches up with powersport sales and service managers as they explain why they prefer to merchandise with slatwall. This year-round industry is constantly changing up inventory relying on the strength of Anchor Core slatwall to display many heavy accessories. These managers discuss how better use of retail space equals higher sales and profits at their dealerships. Repeat customers know that they will be able to find what their looking for with this proven retail display system. John Wallrich has been the Head Golf Professional at Pine Hills Country Club for 29 years. During this time the golf pro shop has been remodeled 3 times. All of the renovations included slatwall from Wind Mill Slatwall Products. Annie’s Fountain City Café located in downtown Fond du Lac was the winner of the Wisconsin Economic Development Corporation’s Main Street Makeover Contest. The improvements made during a 48-hour makeover event in April gave the café it’s new look. As part of the renovations, Wind Mill Slatwall Products provided Slatwall panels for the new merchandising area of the café. This unique contest not only provides additional support and services to the winning business, but it also showcases how retailers are reinventing themselves, gaining new market share. A quick tour of Wind Mill’s booth at the 2018 GlobalShop! We displayed many new slatwall solutions including Subway Tile, Dry Erase, and DecoMetal HPL slatwall. Lyn M. Falk, President of Retailworks, Inc. explains why Wind Mill Slatwall Products, Graphic Series slatwall panels played such an important role in the design of Road America’s new 6,000 sq. foot gift shop center. Kaehler Luggage has been outfitting world travelers since 1920, offering the finest selection of quality travel cases and accessories. As a specialty store, they select products based on a vast experience and knowledge of manufacturers, materials, and design, offering only high end luggage. Recently they added a 5th location in Hinsdale, Illinois. We interviewed Mark Kemerer as to why Kaehler selected our PALLETwall™ display panels. Wind Mill custom display panels works great in accessory and jewelry stores. 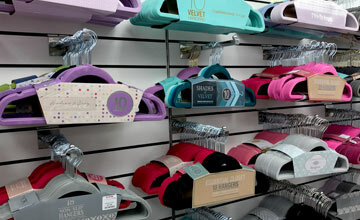 Three inch, or even two inch on-center slatwall can hold a large amount of accessories and jewelry products. 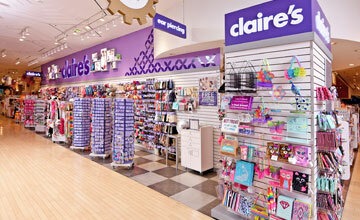 Merchandise can be easily arranged and rearranged whenever necessary. Custom display panels provides a stable wall or fixture system that can accommodate a wide variety of hooks, brackets, baskets, bins, shelves and other display options for merchandising your products.